It was a hot day and the kids were itching to get out. We couldn’t really get out of the house and go somewhere. 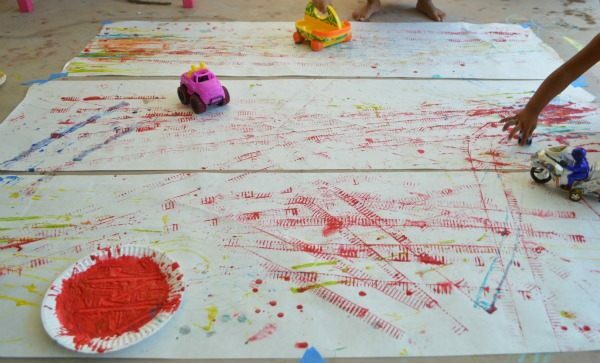 Instead we went to our backyard and did what we do best – play with paint. We have painted with cars before of course we have; it is a kids classic. 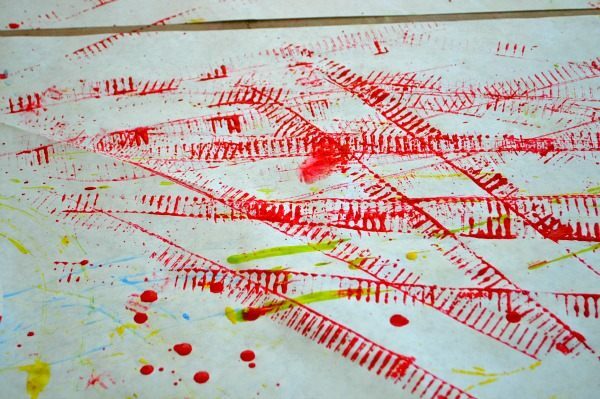 That day however we did the art activity on a larger scale for extra fun. In kids world, bigger = better, right? 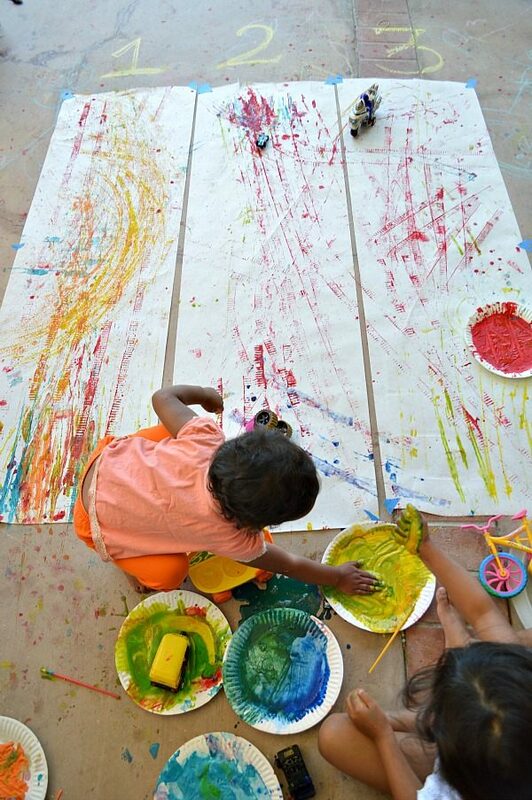 Large scale art activities are great for warm summer days where you can get messy and creative *outside* your house. They are also perfect for days you need the kids to burn off some energy while having tons of fun. 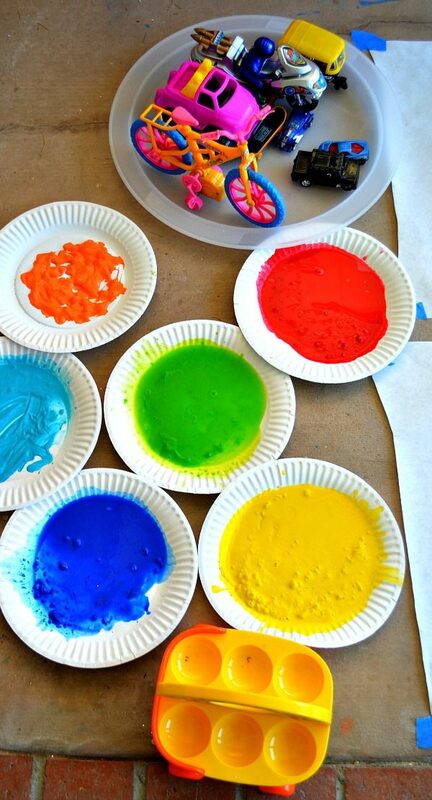 Gross motor art activities are fantastic for encouraging active kids to create. They will be moving while creating! 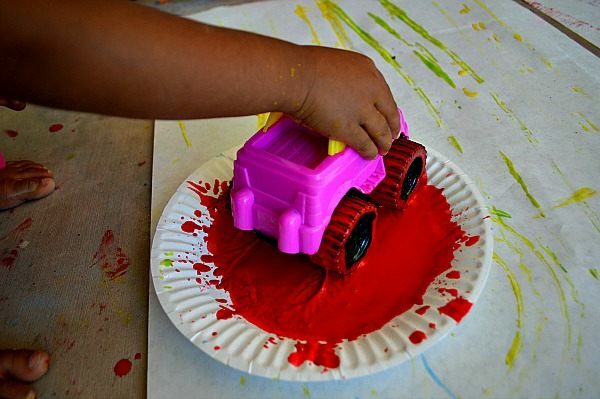 I set out a variety of large vehicles we own along with some poster paint and mixed up powdered tempera paint. 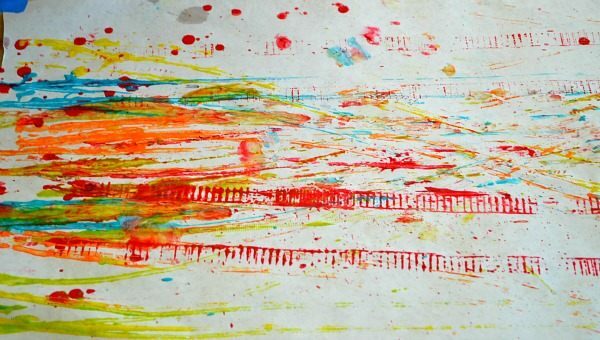 I observed that the powdered tempera made much better and vibrant prints. 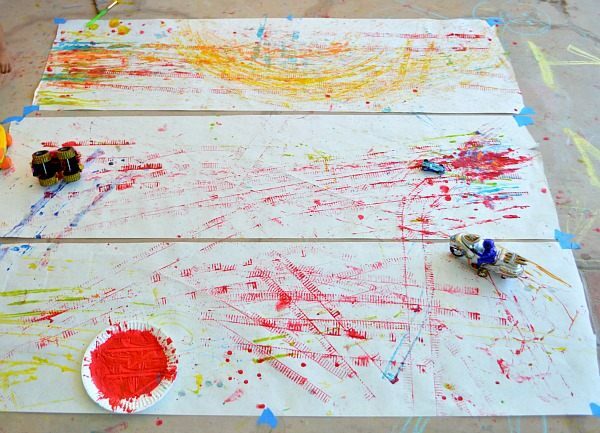 As mentioned earlier you could do this art activity on a cookie sheet but that day we wanted something bigger. I taped down 3 sheets of butcher paper and marked numbers on the top. My hope was that we can make the art project into a race. Meh! then I realize that I have 2.5 year old who very typical of all 2.5 year old has absolutely zero regards for rules. So yeah, race idea went kaput! But if you have older kids you could do a race car painting project. Ready, set, go -which vehicle wins while leaving a great tire mark. 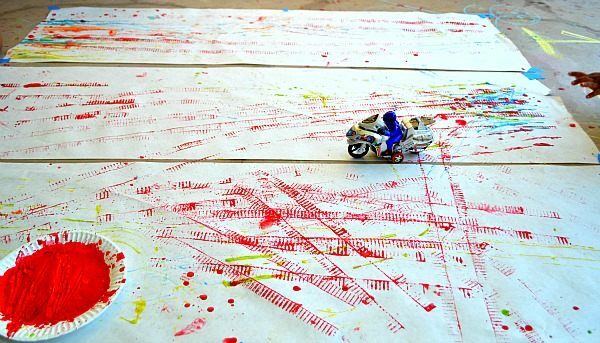 We however had lots of fun moving around with big vehicles and dipping them in paint.My 4 year old raced them across the paper and often times flew them across the paper- even the cars flew. Ironically, my 2 year old was very interested in making the tire marks. These were made by her vehicle. 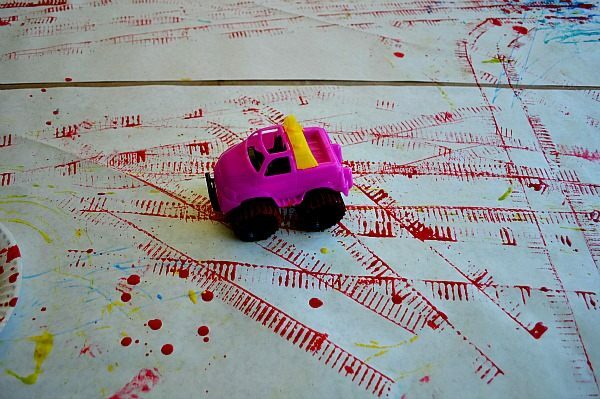 She was very persistent in getting from one end of the paper to the other with her car to make prints.This pink truck right here quickly became my toddler’s favorite because of the fantastic tire marks. She dragged this toy back and forth to paint. 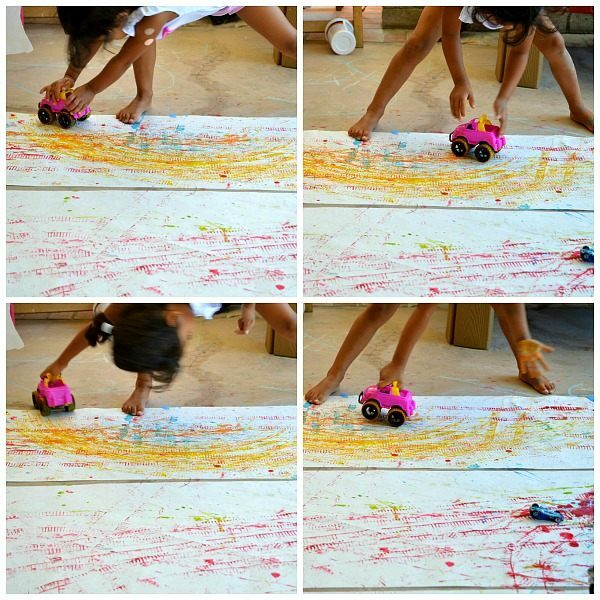 She tried racing the cars from the end and saw that the paint marks were not strong enough. Just by pushing the vehicles she realized that the prints don’t transfer that much. She went on to dragging the vehicles from one to the other. My 4 year old however was all about getting the vehicles to fly, roll and generally move. Here is my 4 year thoroughly enjoying the large scale art activity.. These pictures remind me of a giraffe drinking water! We love the prints made by our big pink truck. Every activity involving paint becomes a sensory activity, right? Affiliate link to the powdered tempera paint. To continue to play with us, keep in touch via Facebook, Twitter or Google Plus or our personal favorite Pinterest.